Hyderabad (Urban) District in its present shape has come into existence in August, 1978 consequent on formation of a new District, Ranga Reddy from the erstwhile Hyderabad District. All the rural areas of erst-while Hyderabad District have been included in Ranga Reddy District, while thearea of Muncipal Corporation of Hyderabad (Exclding a small part), Secunderabad Cantonment, Lalaguda and Osmania University are included in Hyderabad District. There are 66 villages in the District and they are grouped into erstwhile talukas, Viz., Charminar, Golconda, Musheerabad and Secunderabad. The State capital being in this District, it is highly developed in all aspects. With a view to bringing up the administration to the door steps of the people to solve their problems upliftment of the people, the Government as a policy took a decision to restructure the Lower level administrative set-up in the state consequently, Revenue Mandal were setup. Hyderabad district occupies an area of approximately 217 square kilometres (84 sq mi). As per the 2011 census of India Hyderabad district's population was 3,943,323, with a religious make-up of: Hindus (51.89%), Muslims (43.45%), Christians (2.22%), Jains (0.5%), Sikhs (0.29%) and Buddhists (0.03%); 1.58% did not state any religion. Roughly equal to the nation of Liberia or the US state of Oregon. The culture of Hyderabad is a diverse one. Not only does it have an amalgamation of different cultures, Hyderabad boasts of a rich cultural heritage too. Being ruled by the Asaf Jahi dynasty, it came to be known as the “city of Nizams”. As this dynasty crumpled, the Mughals took over and brought about sea change in the cultural outlook of the people. Today Hyderabad flourishes in its rich cultural history. The contemporary world sees this city as a blend of unique cultures with a touch of modern lifestyle. In general, Hyderabadi people are regarded as very friendly and hospitable. As a matter of fact, generosity is the other name of the Hyderabadis. They take immense pleasure and pride in conversing in their local, characteristic and vibrant Hyderabadi language, which is a mix of Urdu, Hindi, and Telugu. The Hyderabadi Urdu is more like city’s vernacular of Hindi language. It thrives in a world of its own. Like the Mumbai ‘tapori’ language, Hyderabadi lingo too has its own dissimilar resonance and flavor. It is more assorted as it has its own dialects in different parts of the city. If the actual Hyderabadi has a manifestation of Urdu language and is archetypal to the old city, the new city has a fair mix of English and Telugu to it. In Secunderabad Cantonment region, there is a typical Tamil touch to it, due to the proximity of Tamil Nadu to it. You will find a very surprising element in these people. They wear the latest branded stuff, flaunt attitude and drink gallons of beer in the most happening bar. But when it comes to culture, no one can beat them nor question their traditional beliefs. You will find the most pretty women wearing shorts and tank-tops one day and at a temple in a nice traditional saree the other day! So be prepared to contact the blend of tradition and modernity in the unique city of Hyderabad. 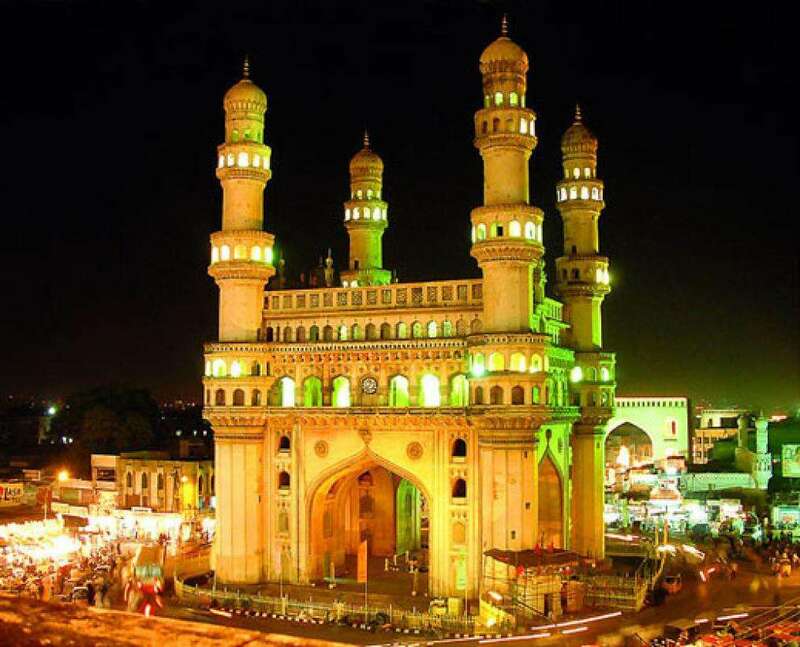 Hyderabad, the Historic beautiful city is the capital of Telangana. Originally it was founded by Sulthan Mohammed Quli Qutub Shah the 5th King of the Qutub Shah dynasty in 1590 A.D. at Golconda Kingdom. Formerly, Hyderabad was known as Bhagyanagar. This was named in the sweet memory of the Sulthan’s beloved Bhagamathi. After her death, the name Bhagyanagar had 2 or 3 changes and at last, it was named as Hyderabad Deccan. 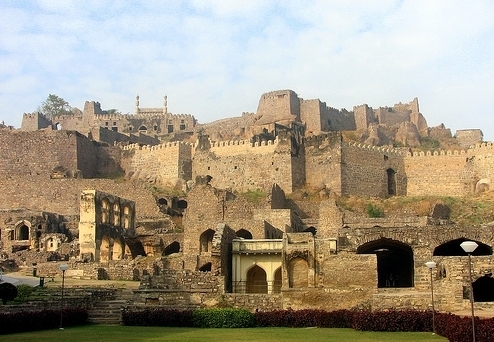 Golconda is one of the most famous forts of India. The name comes from the Telugu words "Golla Konda" meaning "Shepherd's Hill". Golconda was originally a mud fort, which was rebuilt by the first three Qutub Shahi kings over a period of 62 years. The fort is well known for its ingenious water supply system and acoustics among other attractions like the palaces and the famous Fateh Rahben gun. The exclusive Sound & Light Show takes you right back in time. 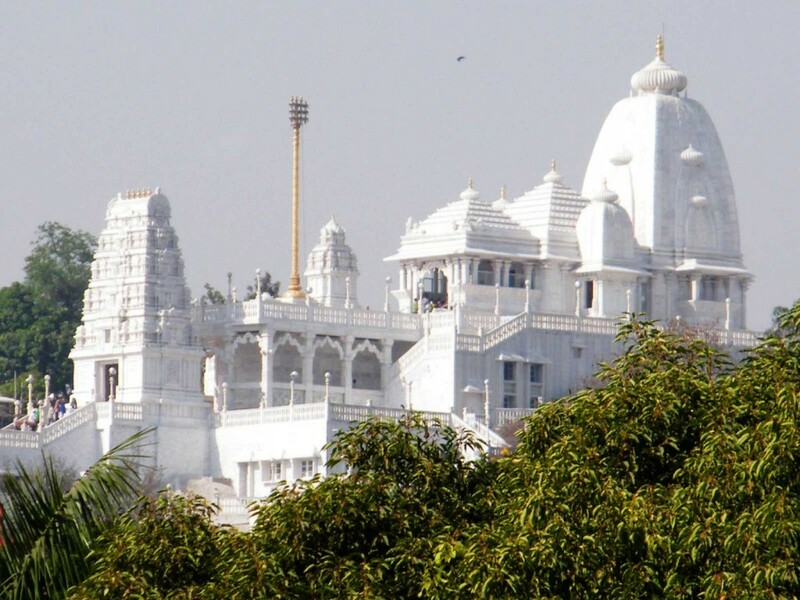 This completely white marble temple of Lord is built on the hillock, the Kala Pahad. The temple has exquisite sculptured and carved ceiling. 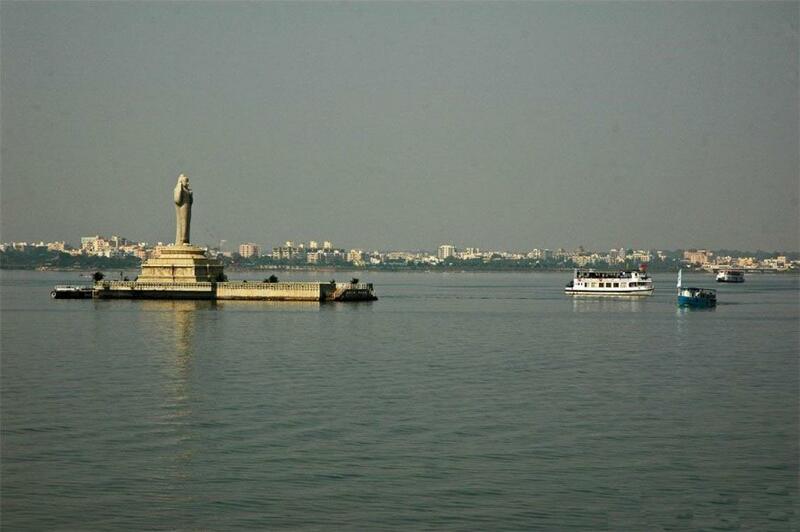 The temple looks down on Hussain Sagar Lake and is illuminated at night. Charminar lies in all its splendour in the middle of Lad-Bazaar - Hyderabad's famous bangle destination. The monument is illuminated in the evenings. 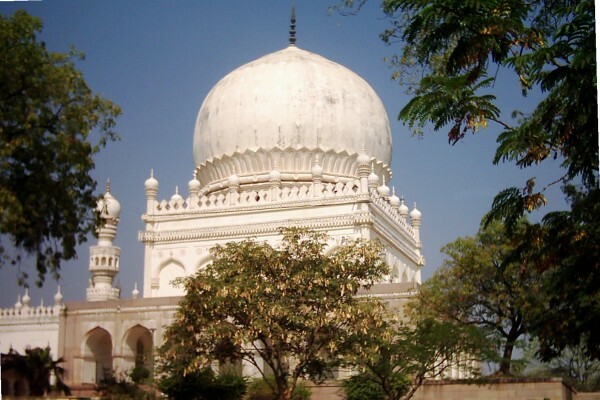 The tombs of the legendary Qutb Shahi kings are at a distance of a kilometre from Banjara Darwaza of the Golconda Fort. These tombs are said to be the oldest historical monuments in Hyderabad. The uniqueness of the tombs lies in the fact that they are the only tombs in the world where the entire dynasty has been buried at one place. Muhammad Quli Qutb Shah, the fifth ruler of the Qutb Shahi dynasty, commissioned bricks to be made from the soil brought from Mecca, the holiest site of Islam, and used them in the construction of the central arch of the mosque, thus giving the mosque its name. It formed the centrepiece around which the city was planned by Muhammad Quli Qutub Shah. This museum is one of the largest collection of antiques by one man - Mir Yousuf Ali Khan, Salar Jung III. The display includes Persian carpets, Moghul miniatures, Chinese porcelain, Japanese lacquerware, famous statues like the Veiled Rebecca and Marguerite and Mephistopheles, a superb collection of jade, daggers belonging to Queen Noor Jahan and the Emperors Jahangir and Shah Jahan, Aurangzeb's sword and many other fabulous items. Hyderabad's most popular boating and water sports location - from speed boats to motor boats, 48 seater launches with starlit dinner on board etc. In the middle of the lake is placed one of the world's tallest monolithic statues of Lord Buddha on the 'Rock of Gibraltar'. 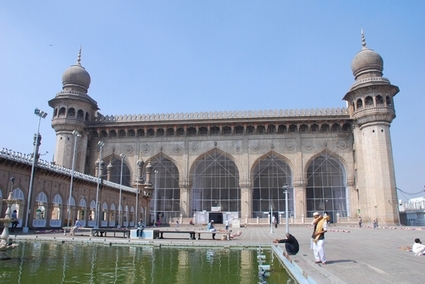 Hyderabad is a historic beautiful City and is the Capital of Telangana. The city is called “Pearl City” and famous for its twinkling pearls and glass embedded bangles. The city was founded during Qutub Shahi dynasty and was called Bhagyanagar. The present Hyderabad district came into existence in August 1978 with total geographic area of 199.6 square kilometers and covers the twin cities of Hyderabad and Secunderabad. The District is located at 17 degrees 36 N latitude and 78 degrees 47 longitude and surrounded on all sides by Rangareddy District. The City is situated on the Deccan Plateau at a height of 1788 feet above sea level. The Hyderabad District has been divided into 16 mandals with 4 erstwhile taluks of Charminar, Golconda, Musheerabad and Secunderabad. The Hyderabad district houses some of the most prestigious industries like Vazir sultan Tobacco, Indian Oxygen, Hyderabad Industries, Thane Transformers company, Kedia Vanspati (Agarwal Industries) etc besides various public sector undertakings. With cosmopolitan culture, the city has congenial and hospitable environment for growth and development of SSI and Tiny industries. Charminar, Golconda fort, Salar Jung Museum, Makka Maszid, Zoological park, NTR Gardens, NTR Ghat under Buddha Purnima Project, Birla Science Museum and Temple, Ramoji Film City etc are the places of tourist attraction. Hyderabad District, in its present shape, was formed in August 1978, when all its rural areas were included in Ranga Reddy District. 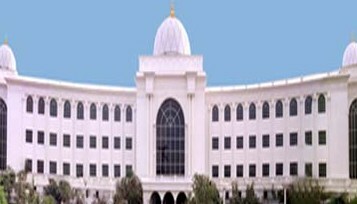 The area of Municipal Corporation of Hyderabad (excluding a small part), Secunderabad Cantonment, Lalaguda and Osmania University are included in Hyderabad District. All the 65 revenue villages with its erstwhile taluks of Charminar, Golconda, Musheerabad and Secunderabad have been regrouped into 16 mandals. River Musi, a tributary of river Krishna, runs through the city, dividing it into old and new city. Drinking water needs of the city are met by the water from Osman sagar, Mir Alam Tank and from Manjeera River in Medak district. Proposals to supply drinking water from Nagarjuna Sagar to meet city’s demand are also under active consideration of the Government. Geographical Area 199.60 Sq.Kms. It Is 5th Largest City In India. Altitude 1778′ Above Mean Sea Level.